Taj MuttHall Dog Diary: Coming Right Up: Agility Weekends! Plus Puppies! SUMMARY: Four USDAA trials in the next 5 weeks. Starting this weekend, then next weekend, then a break, then two more weekends. Whew! Busy! I might go to only three of the four, which include Boost's last 3 chances to earn her last Steeplechase Qualifier for Nationals, and her one last chance to earn her DAM Qualifier. I am starting to waffle about Nationals. I do have fun when I go. It's just--well--all this. OK, I'm thinking about it again with a little prodding from friends. Arrrghhhh, tough choices! Why can't everything in life be easy? Boost is still knocking bars, still refusing jumps that I think are obvious. Instructor has lots of good suggestions on things to work on, and I do some of them, but sometimes I just can't get it right even when I think I am! Takes someone else to watch me and tell me again where I'm going astray. 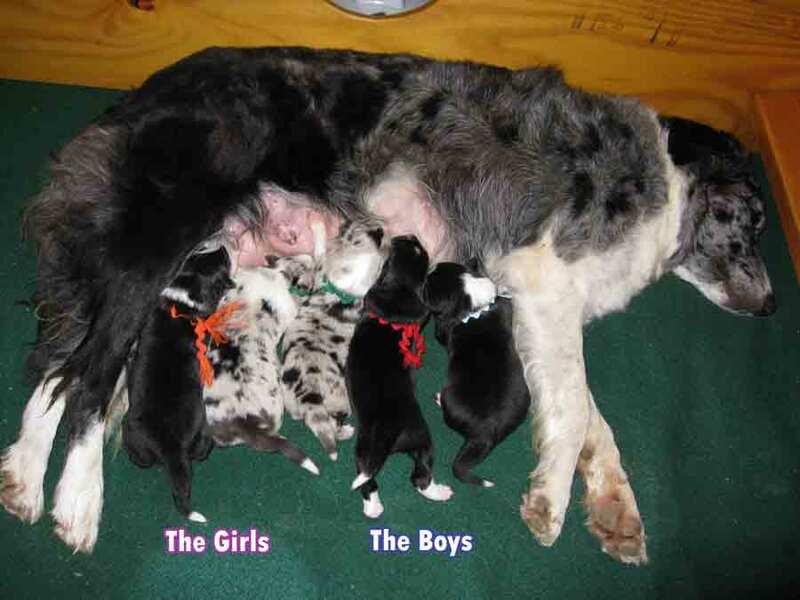 But, all that aside, here's a bonus puppy picture: Boost's mom with her new litter of full siblings. (Not my photo.) More agility blue merles, coming right up! Good luck! Can't wait to hear how you do. Cute, cute pups.